Katie joins the marketing team as Content & Bid Producer, creating and maintaining our company’s digital assets as well as coordinating the bid process. 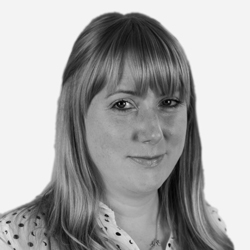 With 16 years’ experience in marketing and advertising, Katie brings a wealth of knowledge in helping to communicate clearly and effectively with the marketplace. A series of well-timed fate-like events! And ultimately, reading a job advertisement that resonated with me as the job I should be doing. I worked for 16 years in Commercial Marketing for a regional media business. I worked alongside the advertising sales teams, writing sales proposals and planning multimedia advertising campaigns for clients of all sizes, from local retailers and sole traders all the way through to Ikea and Google. What localisation experience do you have? I’ve got experience in making sure that advertising campaigns are localised in terms of regions. What works in one region, can really fall flat in another. You quickly learn not to treat Liverpudlians and Mancunians in the same way – they definitely don’t identify with each other! I’m looking forward to learning more about localisation on a global & multilingual level. I would say, working for one business for 16 years! I started as an Assistant, then progressed to Exec, Senior Exec and finally Head of Commercial Marketing, supporting a sales team of over 40 people across two centres. In terms of an individual success, I project managed the production of a commercial video ‘This is Manchester’ to promote both Manchester and the business to potential clients and agencies. The whole process was new to me at the time and was a brilliant learning curve. I was really proud of the end result which was used for both commercial and brand promotions. It certainly met the objective of showing London agencies that Manchester isn’t all mills, flat caps, whippets and rain! Either the promise of food, or more likely, my children! I’m really not a morning person, so until I’ve had a coffee (pot of, not cup of), you’re not going to get much sense from me. Currently, I’m renovating our family home. We’ve moved in 5 months ago and have 4 and a half rooms done so far, so pretty good progress. I really enjoy interior design. It’s a real labour of love with all the planning – there’s nothing I don’t have a Pinterest board for! Transforming our home one room at a time is so satisfying. If you weren’t in marketing what would you love to be doing? I’d be an interior designer. Maybe a marine biologist. Or a surfer! Any of these would involve some serious re-training mind you, as I’m clearly not qualified for any of these, but they all look exciting to me and something I can imagine filling my days with. I’m inspired by different people all the time. People who are kind, no matter what the situation. Those who always put others before themselves. People who follow their dreams. Who won’t be deterred, who find a way. People who will take a leap of faith and just have a go. Fearlessness. As Content & Bid Producer at Capita TI and with 16 years' experience in marketing & advertising, Katie is responsible for creating and managing our company's digital content and customer bids. When not at work, Katie enjoys decorating and renovating her new family home.